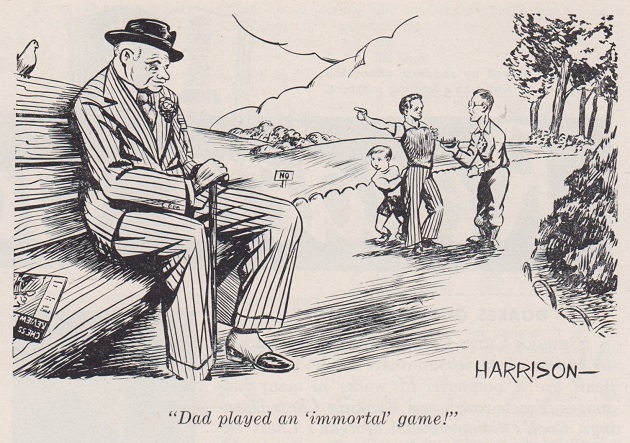 Many games labelled ‘immortal’ have been discussed in C.N. over the years, but are there any not yet mentioned here? 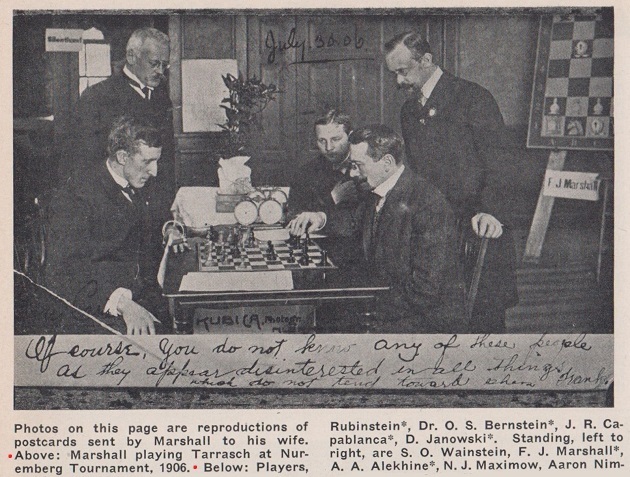 The caption text is from the accompanying article (pages 14-15) by Fred M. Wren, ‘Attempts at Immortality!’, in his ‘Tales of a Woodpusher’ series. 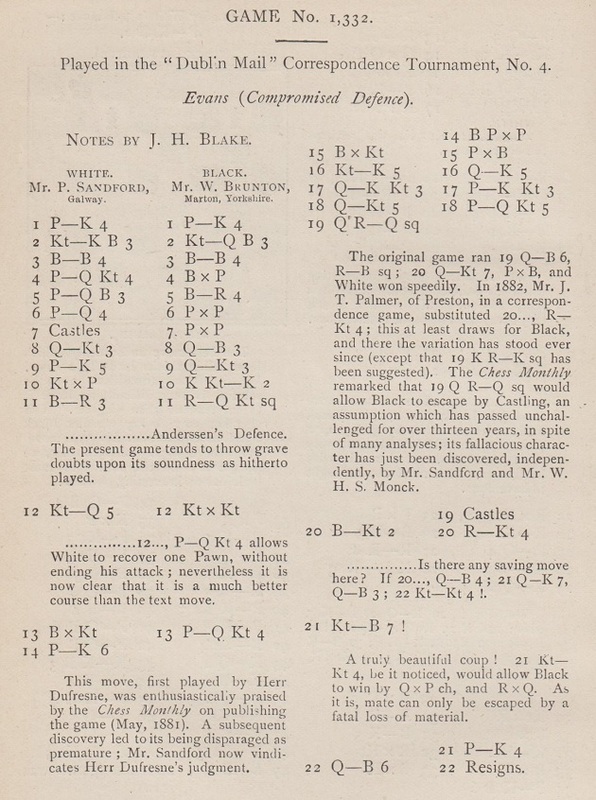 There are three key moves, but we lack the edition(s) of the magazine which may have discussed the solution. 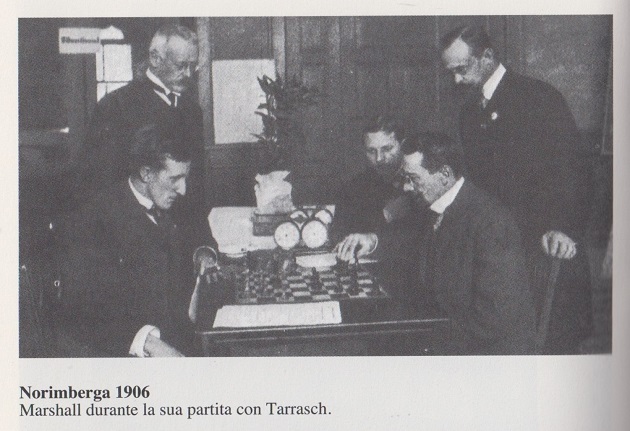 It seems to us that the position is from the 17th and final match-game, won by Tarrasch on 14 October 1905: 1 e4 e5 2 Nf3 Nc6 3 Bb5 Nd4 4 Nxd4 exd4 5 O-O c6 6 Bc4 Ne7 7 Qh5 d5 8 exd5 cxd5 9 Bb5+ Bd7 10 Bxd7+ Qxd7 11 Qe5 d3 12 cxd3 O-O-O 13 a3 Nc6 14 Qh5 g6 15 Qd1 Qf5 16 b4 Qxd3 17 Nc3 Bg7 18 Qa4 Kb8 19 Ra2 Nd4 20 Re1 Rc8 21 h3 Nf5 22 Qd7 Rhd8 23 Qxf7 Rc7 24 Qe6 Re7 25 Qxe7 Nxe7 26 Re3 Qc4 27 Rxe7 Bf8 28 Rxh7 d4 29 Rc2 dxc3 30 Rxc3 Qe2 31 g3 Bd6 32 Kg2 Rf8 33 White resigns. A few months ago, C.N. 10563 criticized Jimmy Adams’ treatment of sources in Gyula Breyer. The Chess Revolutionary (Alkmaar, 2017). At the Kingpin website Mr Adams has recently made a response; much of it reads like a leg-pull, and here we simply revert to the fundamental issue. Question: How many of the above authors treat sources in a manner even remotely similar to Jimmy Adams’ method? ‘In his will (National Archives, PROB 11/1855/197) Alexander McDonnell (/MacDonnell) identified as his brother Thomas MacDonnell, of Belfast, a barrister. The only Belfast barrister of that name at that time was a graduate of Trinity College, Dublin, who, accordingly, has an entry in Alumni Dublinenses (edited by G.D. Burtchaell and T.U. Sadleir, second edition, Dublin, 1935). On page 533, the entry for “McDonnell, Thomas” states that he was admitted on 7 November 1808, aged 15, a son of Thomas, a merchant, having been born in the county of Antrim; he obtained his Bachelor of Arts degree in Spring 1813, was called to the Irish Bar in 1816 and later became a QC. 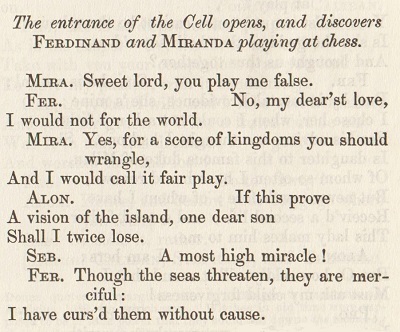 The entry concludes by referring the reader to Frederic Boase’s Modern English Biography. 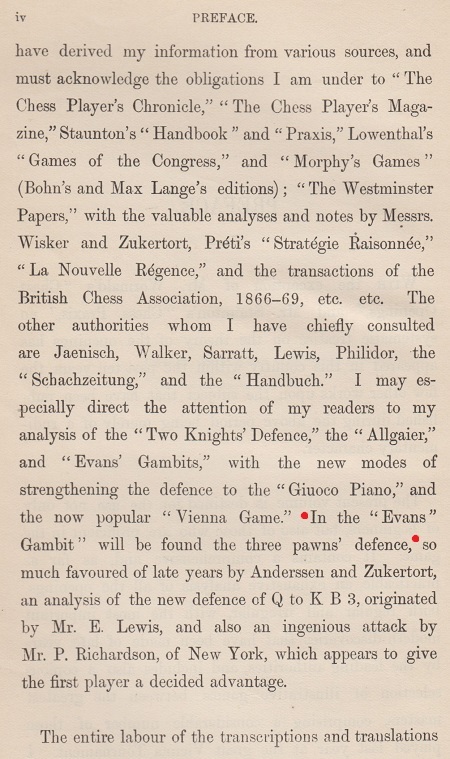 On page 285 ‘Game the Fourth’ had the heading ‘The Anderssen-Zukertort, or three pawns defence to the Evans Gambit’ as an introduction to the moves 1 e4 e5 2 Nf3 Nc6 3 Bc4 Bc5 4 b4 Bxb4 5 c3 Ba5 6 d4 exd4 7 O-O dxc3 8 Qb3 Qf6 9 e5. With regard to the ‘Chinese Immortal’, won by Liu Wenzhe against J.H. 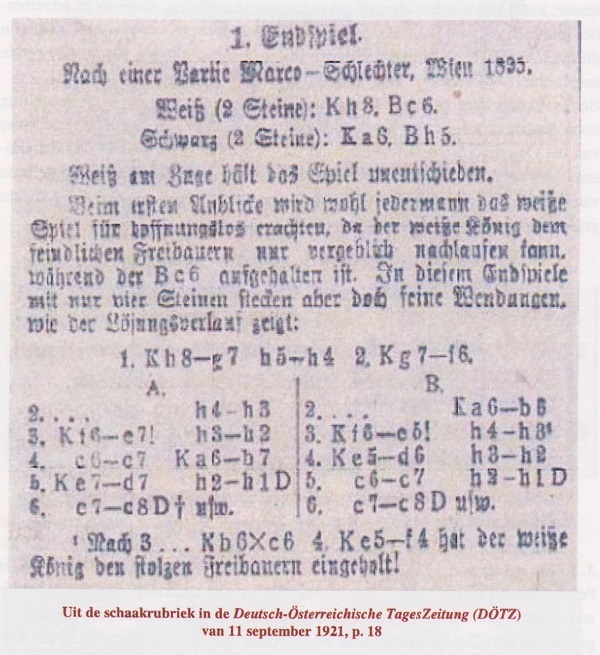 Donner in the Buenos Aires Olympiad, 1978, what was the nature and extent of the attention it received in the Chinese media of the time? 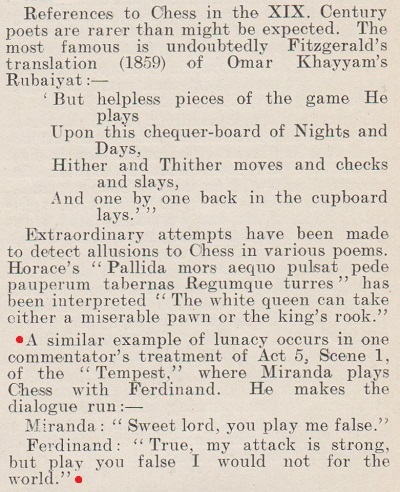 Would Chess Review have written similarly if the victim of the fatal heart attack had been a US master? See too The Facts about Larry Evans for his flippant, inaccurate remarks on Juan Quesada’s death. Our correspondent asks whether earlier occurrences of the term are known. 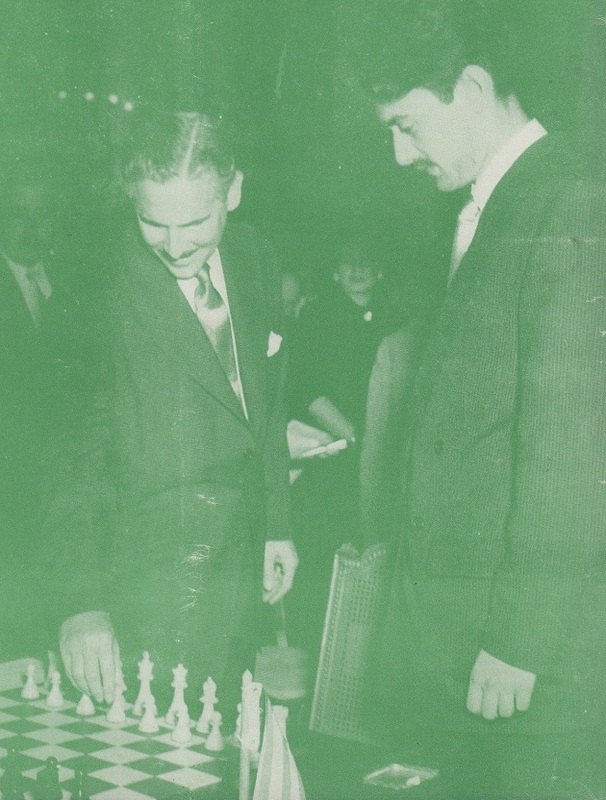 For observations on the physical appearance of Smyslov’s hands see page 57 of Chess Duels by Yasser Seirawan (London, 2010). 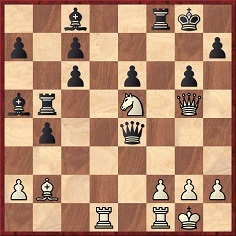 1 e4 e5 2 Nf3 Nc6 3 Bc4 Bc5 4 b4 Bxb4 5 c3 Ba5 6 d4 exd4 7 O-O dxc3 8 Qb3 Qf6 9 e5 Qg6 10 Nxc3 Nge7 11 Ba3 Rb8 12 Nd5 Nxd5 13 Bxd5 b5 14 e6 fxe6 15 Bxc6 dxc6 16 Ne5 Qe4 17 Qg3 g6 18 Qg5 b4 19 Qf6 Rf8 20 Qg7 bxa3 21 Rad1 Rb5 22 Rd8+ Kxd8 23 Qxf8 mate. 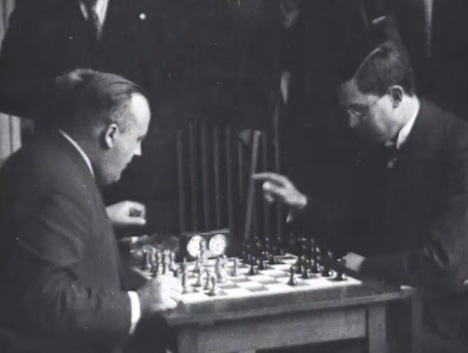 Two further contributions from Olimpiu G. Urcan (Singapore) regarding Chess Masters on Film: an informal Bogoljubow v Euwe game in 1928 and the opening of the 1956 Candidates’ tournament. Our correspondent reports that the reverse of the (undated) photograph states that it was taken in Sweden. The analytical point referred to in C.N. 10667 will be discussed in a forthcoming item. 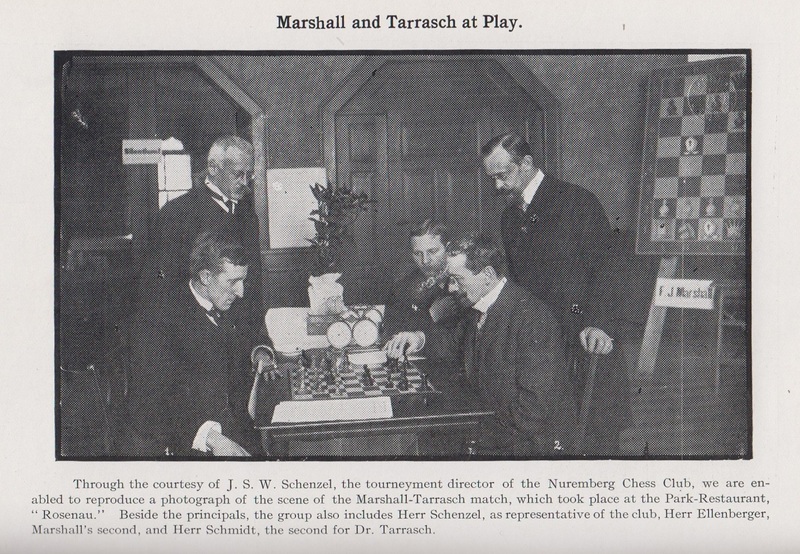 Play continued 21 Nf7 e5 22 Nh6+ Kh8 23 Rd8 Kg7 24 Rxf8 Kxf8 25 Qf6+ Ke8 26 Ng8 Resigns (Siegbert Tarrasch v Christian Kelz, Nuremberg, 1889 or 1890). 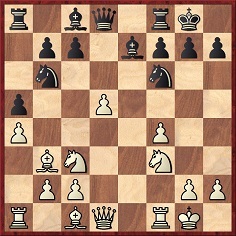 The previous moves were 1 e4 e5 2 Nf3 Nc6 3 Bc4 Bc5 4 b4 Bxb4 5 c3 Ba5 6 d4 exd4 7 O-O dxc3 8 Qb3 Qf6 9 e5 Qg6 10 Nxc3 Nge7 11 Ba3 Rb8 12 Nd5 Nxd5 13 Bxd5 b5 14 e6 fxe6 15 Bxc6 dxc6 16 Ne5 Qe4 17 Qg3 g6 18 Qg5 b4 19 Rad1 O-O 20 Bb2 Rb5. 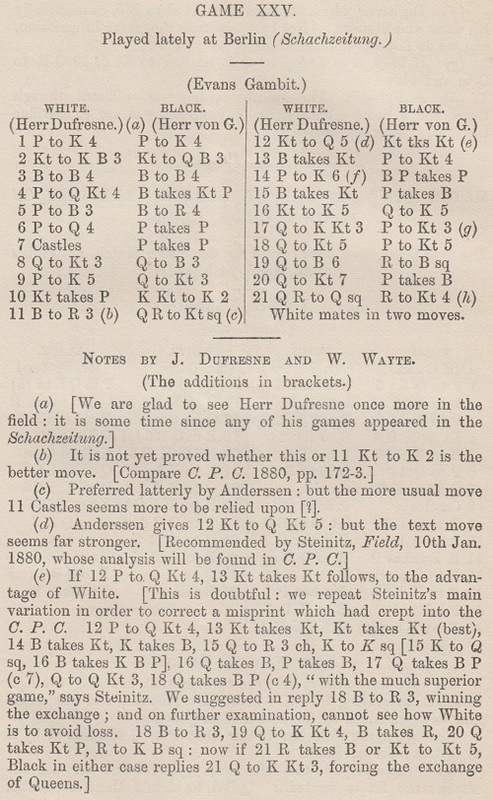 Up to move 18 the game followed the Dufresne one given in C.N.s 10667 and 10670. A note by Tarrasch on the possibility of 22 Qf6 (referred to later in the present item) would have been welcome. 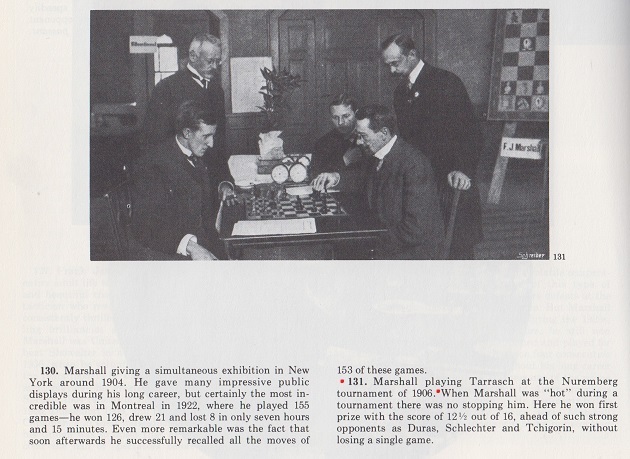 Source: Play The Evans Gambit by T. Harding and B. Cafferty (London, 1997). Wanted: nominations for the finest logos designed for any chess match or tournament. 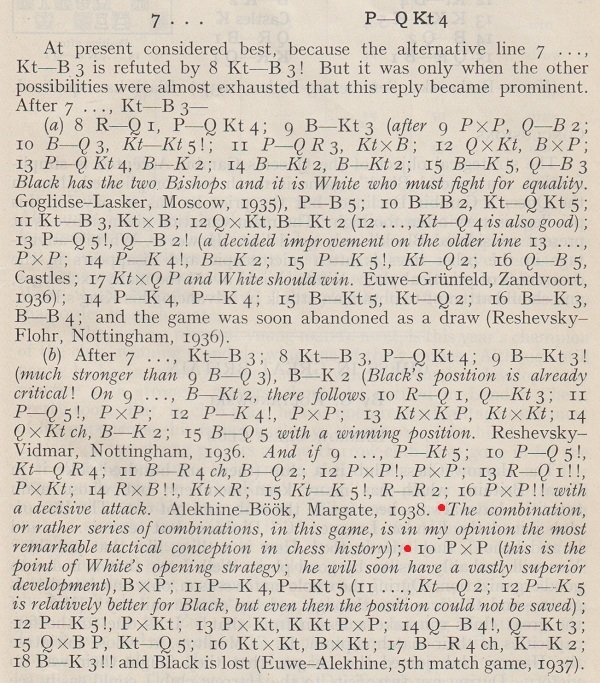 Ross Jackson (Raumati South, New Zealand) asks what is known about the claim on page 190 of The World of Chess by A. Saidy and N. Lessing (New York, 1974) that during the 1927 world championship match Jaffe sent Alekhine a cable which ‘contained an analysis of a variation of the Queen’s Gambit with a new move suggested by Jaffe, which Alekhine is thought to have adopted’. 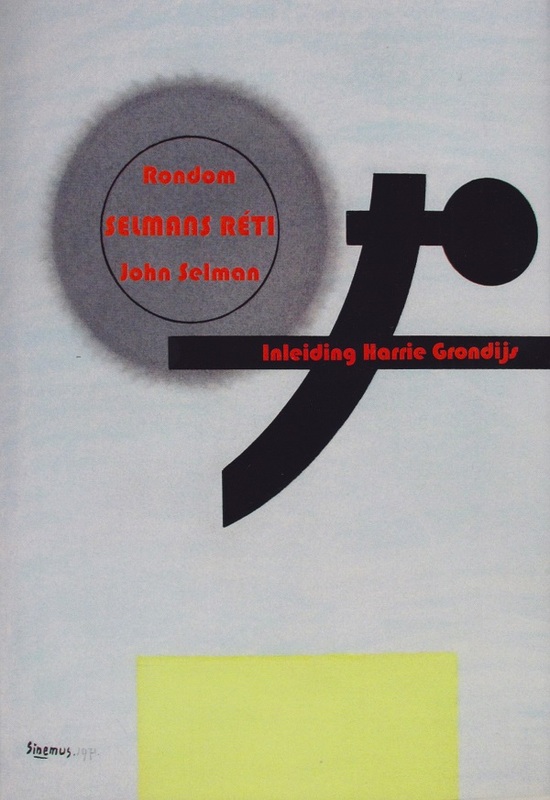 ‘The book, which is mainly in Dutch, features two manuscripts by John Selman written during the Second World War, followed by a discussion of the true origins and copyright of the manoeuvre in Réti’s most famous endgame study. 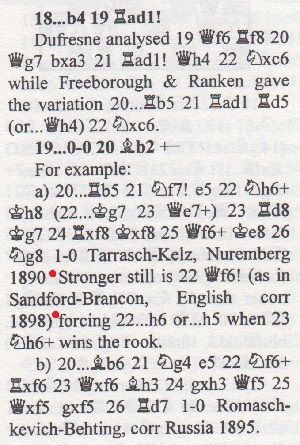 Source: pages 157-158 of Great Chess Books of the Twentieth Century in English by Alex Dunne (Jefferson, 2005), concerning Yuri Averbakh’s Bishop vs. Knight Endings and other volumes in the series. 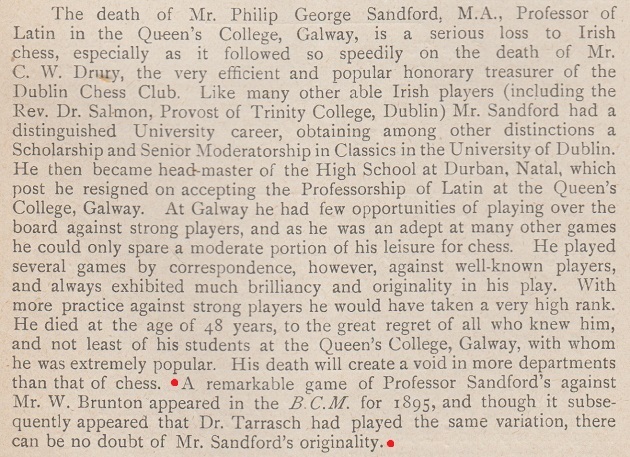 On page 123 Dunne mentioned generally, without referring to the Reykjavik match, that Fischer ‘brought the latest Chess Informant with him to his tournaments and his matches’. 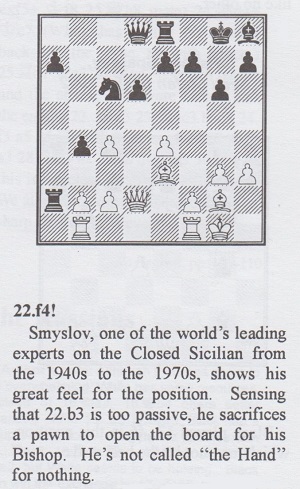 Source: page 114 of Bobby Fischer Goes to War by David Edmonds and John Eidinow (London, 2004). The text is on page 131 of the New York, 2004 edition. ‘Fischer’s other aide was a kindly, accommodating, New Zealand-born international master, Bob Wade, a resident of south London and the owner of a vast chess library. 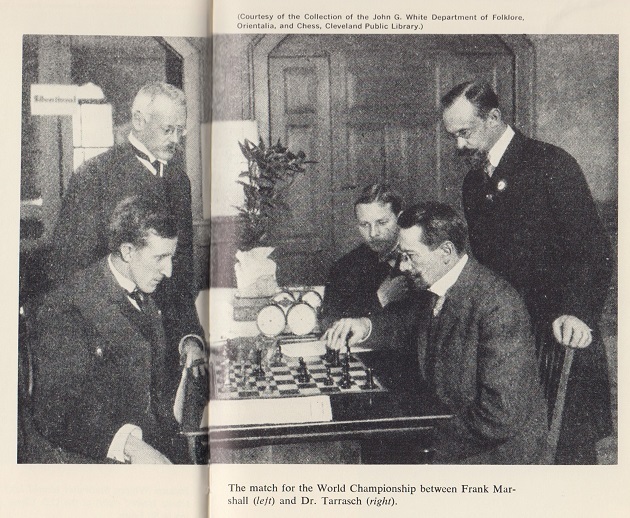 He had a more specific task: at Ed Edmondson’s request, he had sent Fischer copies of all the games he could find played first by Taimanov, then by Larsen, then, at the Candidates final stage, by Petrosian. 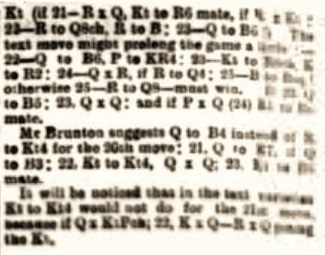 Now Edmondson gave him the same brief for the world championship. 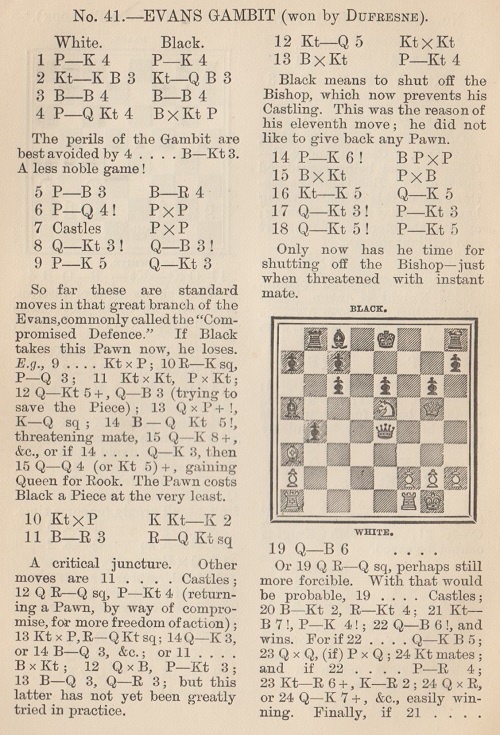 With infinite pains, Wade researched and compiled all of Spassky’s published games; some were well known, while others were located in obscure journals. The folder ended up with over a thousand pages covering over a thousand games. He dispatched it to Fischer via Edmondson, who had it bound in red velvet. Fortunately, it reached its destination, for the work had been done by hand and there was no other copy. 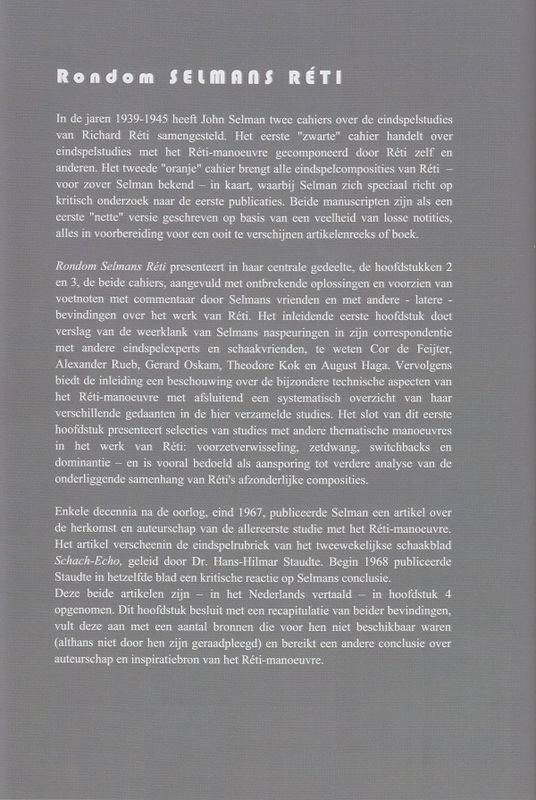 Source: the above-mentioned book by Edmonds and Eidinow, pages 114-116. The wording was slightly different on pages 131-132 of the New York, 2004 edition. Source: page 25 of the New York Times, 1 April 1972 (C.N. 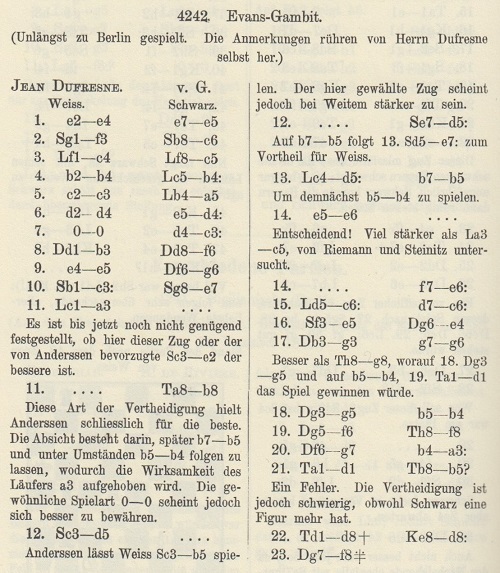 8962). 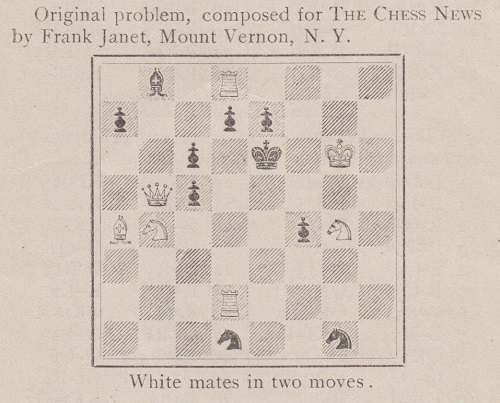 Source: page 109 of Bobby Fischer vs. the Rest of the World by Brad Darrach (New York, 1974). Source: page 176 of Endgame by Frank Brady (New York, 2011). 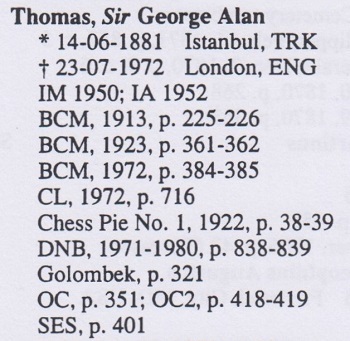 Alper Efe Ataman (Izmir, Turkey) asks for information about Sir George Thomas’ early connection with Turkey. 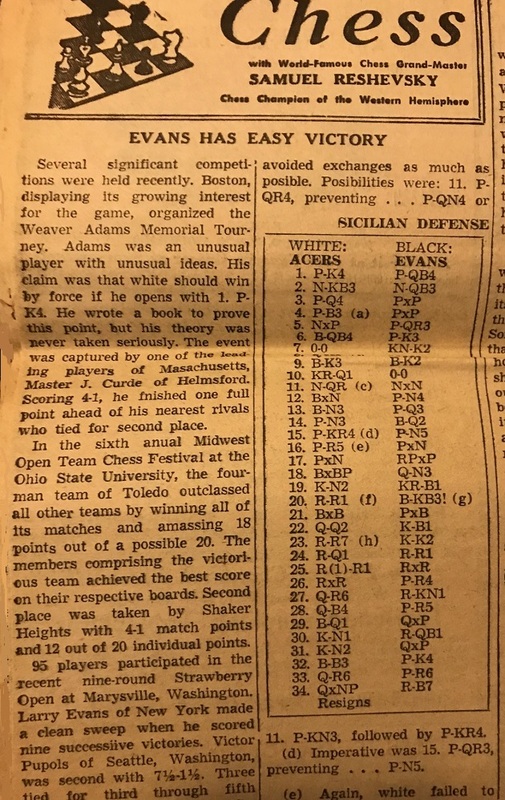 The above-mentioned BCM articles in 1913 and 1923 and the 1922 Chess Pie feature made no reference to his place of birth. 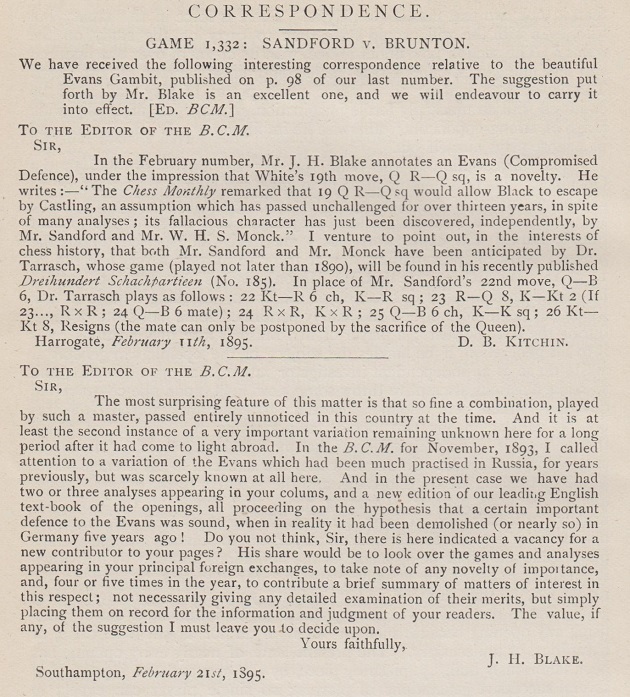 Nor did the articles published in the BCM in 1920 (C.N. 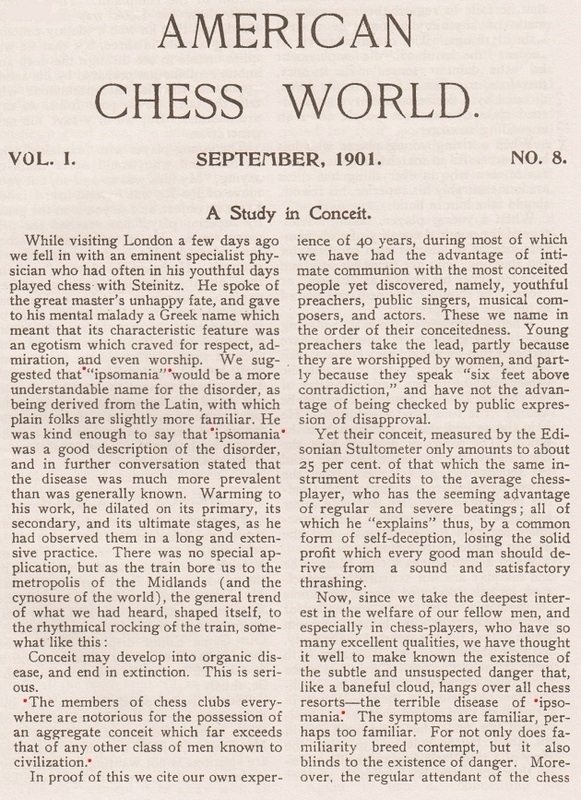 9844) and Chess Review in 1935 (C.N.s 7088 and 9848). 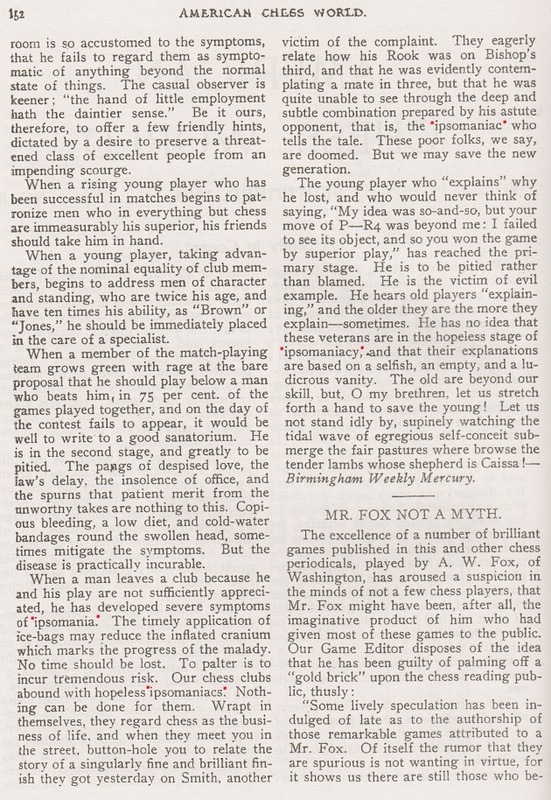 The obituary on pages 384-385 of the October 1972 BCM, by W. Ritson Morry, asserted unimpressively that Thomas was born in Constantinople on 14 June 1881, ‘the year of Zukertort’s memorable victory in the great London Tournament’. Published in 1971, Chicco and Porreca’s Dizionario enciclopedico degli scacchi had been more specific, giving Thomas’ birth-place as Therapia (Tarabya), a district of Constantinople/Istanbul and a centre of British administration in Turkey. 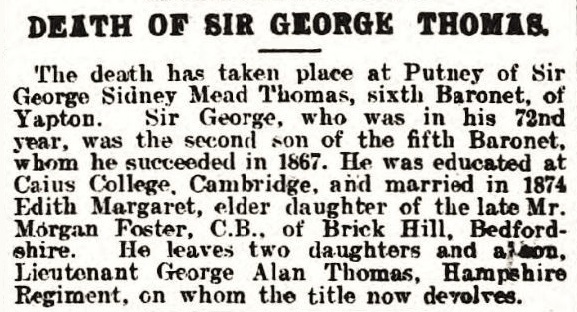 The information is thus consistent with the statement in the Oxford Dictionary of National Biography that Thomas ‘was born in the British consulate in Constantinople’. Richard Reich (Fitchburg, WI, USA) has shown us some samples from his set of about 20 undated chess columns by Samuel Reshevsky in the Jewish Press. 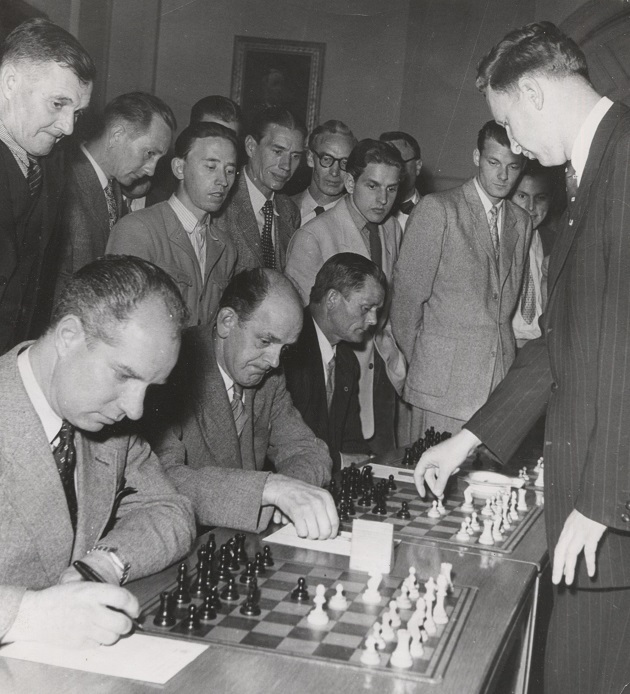 The above report is on a tournament held in 1967 (in Jerusalem, and not Tel Aviv). 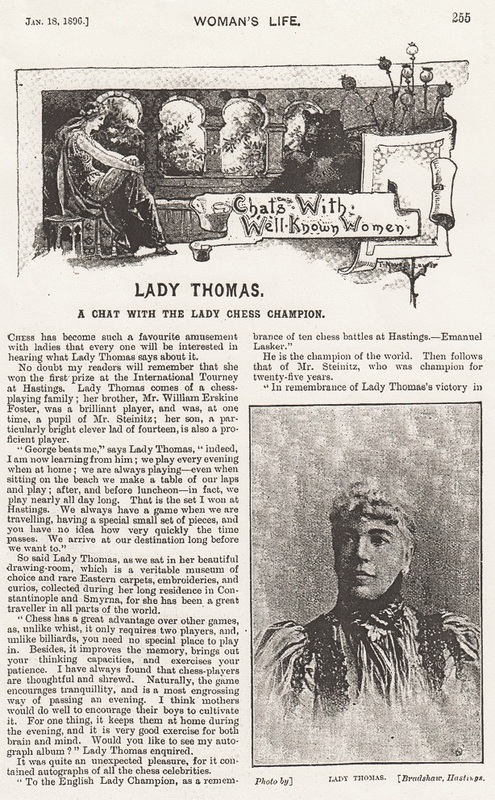 Our correspondent asks for further information about the series. 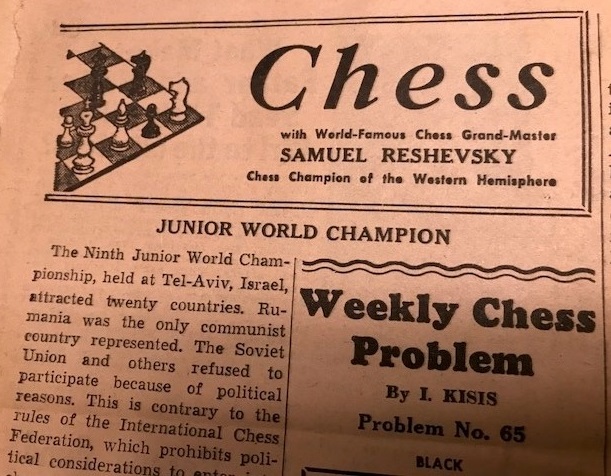 He comments too that the Jewish Press was mentioned in an article about Reshevsky by Saul Jay Singer (whose penultimate paragraph states that Reshevsky had a meeting with Fischer in Los Angeles in 1984).